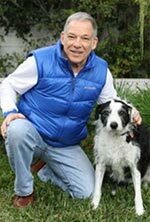 In addition to his work as a dog bite expert, Richard Polsky, PhD is a qualified cat bite expert. In this section of dogexpert.com, Dr. Polsky presents information about cat bites that might help attorneys better understand this area of litigation. Relevant animal behavior information that might prove relevant in cat bite litigation is sparse when compared with the kind of animal behavior information available to attorneys in dog bite litigation. Cat attacks do happen on people, but they happen much less frequently than dog attacks. One reason for this is because, generally speaking, the style of interaction between cats and their owners differs in some basic ways when compared with a the style of interaction a person has with the cat. Generally, most cats are not as socially needy as most dogs; hence there are not as many opportunities for cats to attack humans. For example, because of the relatively distant social relationship household cats typically cats have with their owners, the causes underlying cat attacks differ from dog attacks. Dog attacks are more socially driven. For example, most cats do not display protective type aggression towards people in a fashion similar to dogs. Thus, more so than dogs, cats will allow human strangers to transgress into their territory. It is unusual to find a cat attacking a person because of so-called “dominance” tendencies. However, like dogs, the motivation of fear underlies many instances of aggression in cats towards people. 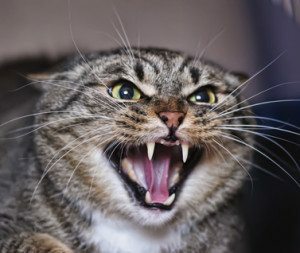 Examples of fear-based aggression in a cat towards a person happens when the cat is startled because an unfamiliar person suddenly places his hand in the cat cage, handles the cat inappropriately, or the cat who bites when stepped on. Redirected aggression also may also be the cause of some cat attacks on people. for example, an indoor cat who is in conflict with a outside neighborhood cat who is inaccessible (i.e. neighborhood cat approaches a patio door), may turn and attack a nearby human. Some cats will also respond with aggression due to side effects of medication. Hence, the veterinarian who medicates a pet cat for treatment has the responsibility of informing an owner of the risk of being attacked. From a legal perspective, cats differ from dogs in several respects. First, in most states cats are legally allowed to roam, and this eliminates the possibility for many lawsuits based on negligence. Thus, for example, should the cat bite someone while roaming through a residential neighborhood, the owner of the cat would not be strictly liable. Instead, the cat bite victim must prove that the owner knew about the cat’s dangerous propensities. Unlike dog bite statutes that exist in many American states, strict liability for cat bites does not exist. Lawsuits stemming from cat bite injury stand a greater chance of success if negligence can be proved. A good example of this happened at a Petsmart store in Austin Texas. This company has the policy of letting their stores have days when cats put on display for adoption, and the cages in which the cats are displayed are located in the store. In one case, a middle age lady happened to be in the store shopping with her daughter and noticed the cats in their cages. The defendant states that she was told that it was okay to open the cage door to pet the cat, and when she placed her hand in the cage, the cat clamped onto her hand and would not let go. Severe injury resulted and the victim was hospitalized for nearly a week. Petsmart was sued for negligence, and the case settled out of court. Plaintiff argued that Petsmart should have insisted that adoptions impose risks to the patrons of the store, and that a locking mechanism should have been placed on all cat cages. I recall one cat bite case in which I served as an expert. In this case the owner brought her calico cat to the veterinary hospital for grooming. Previously the cat had been there before usually without a problem. However in this particular instance the cat became anxious and the groomer with permission of the veterinarian, medicated cat with a unusually strong dose of valium. This helped sedate cat, which allowed the cat to be groomed , but shortly thereafter when the cat returned home it uncharacteristically attacked its owner. The cat bite was severe. Animal behavior expert opinion concluded that the drug probably had much to do with this cat’s aggressive reactivity towards its owner. The veterinary hospital was sued for negligence. The physical features of cat bite differ from that of a dog bite. Some have described cat bites appearing as if a needle was inserted into the victim’s skin. Infection can easily happen because bacterial pathogens in the cat’s saliva are inserted deep into a person’s tissue. Cat bites, more so than dog bites, can be extremely dangerous, and if the cat bite injury is severe, medical treatment must be rendered immediately.